The Lost City Golf Course lies within the Sun City entertainment complex in the semi-desert of the North-West Province of South Africa. 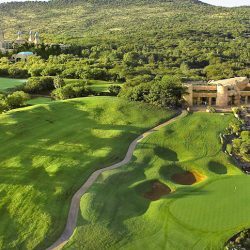 It was designed by South Africa’s grand master of golf, Gary Player and is considered to be amongst some of the best courses in the world. The rich green fairways give a dramatic contrast to the bushveld backdrop and the barren waste bunkers – a special feature of this intriguing course. The desert style design of the golf course has an exotic allure of its own. The most hazardous area of the Lost City Golf Course is the 13’th hole. Inhabiting the water hazard are 38 crocodiles, some of them nearly two metres long. Golfers are discouraged from retrieving their wayward balls from the croc infested pool. The unusual water hazard is just one of the features that make the Lost City Golf Course exciting and interesting to play. No effort was spared to make the course a masterpiece. 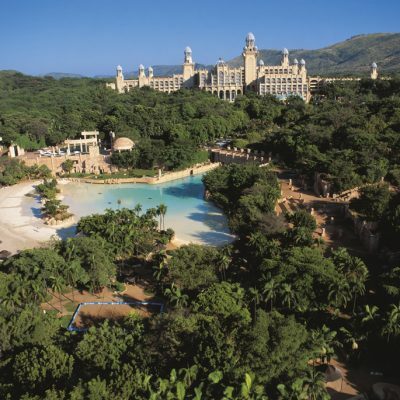 Enjoy playing a round at Lost City Golf Course during your golf holiday in South Africa.